Having devoured my fair share of chocolates through childhood, I landed in the troublesome teenage years. You could say childhood was a happy chocolate-y haze, among other things. Chocolate brands in the 1980s India were not many, 5 Star, Cadbury, Amul. But we were content with our lot. Teenage was a rebellious stage. College was mellowing down time. Life went on, one adventure after another. Chocolate was a constant companion, through course work, friendships, late nights, first dates, romance, heartbreaks, leaving home, staying alone, missed dinners, work pressure, falling in love. For the sake of this post, I was trying to remember how and when I first fell in love with chocolate. For love it certainly is. Sadly I can't remember. But an unmemorable beginning does not diminish the strength of an affair, does it? Even though I still love my bar of 5 Star, with age I have stared liking complex flavours like chocolate with nuts or caramel, a hint of sea salt or a bit of orange zest or the freshness of mint, or tartness of raspberries or the whiff of mocha or even the heat of chillies. And cooking, rather baking with chocolate is also a new found joy. 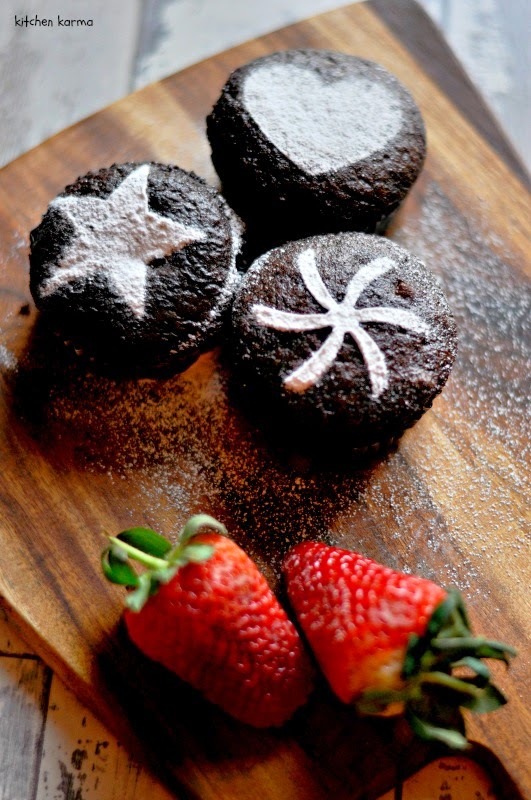 Be it the 3 minute microwave chocolate cake, or chocolate chip cookies, or a decadent chocolate cake or dense chocolate brownies or these chocolate & mocha muffins. These muffins are super easy to bake, moist and rich to eat and once you make them your breakfast is sorted for a couple of days. And who does not enjoy chocolate for breakfast? I know I do! Before we get baking the muffins, let's talk some more chocolates. If you read my blog regularly you would know I support the fair-trade & organic movement. I try and buy fairtrade tea, coffee, chocolates, sugar, spices and as many other ingredients as possible. It is during my fairtrade quest that I stumbled upon Divine chocolates. Not loaded with sugar and other nasty chemicals, these chocolate bars taste natural and have a rich and smooth texture. 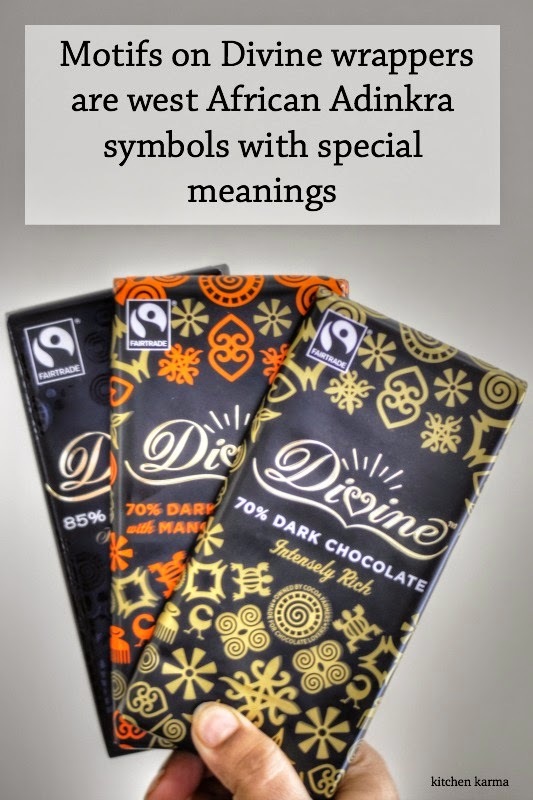 A little search online and I realised that Divine is not only a fairtrade product but that the company is actually half owned by the cocoa farmers in Ghana, Africa. Now in case you are wondering what being fairtrade and co-ownership mean, here is what Divine website says "While Fairtrade ensures farmers receive a better deal for their cocoa and additional income to invest in their community, company ownership gives farmers a share of Divine’s profits and a stronger voice in the cocoa industry." As far as I am concerned it's a great deal. Not only do I get to enjoy my favourite chocolate, I feel like I am helping the farmers' in the process as well. Needless to say Divine is one of my favourite fairtrade brands. So I was delighted when Divine invited me to their pop-up shop in London and gave me some of their chocolates to try. Now comes my shame faced confession. I ate almost all the chocolate Divine gave me, without pausing to take a single photograph. On the good side you can say this is how much I enjoyed eating them, on the bad side, I know this lack of restraint is not very food blogger-ly style. *Sigh* Anyways to make up for it, I went and bought some more bars and this time decided to reign in the greedy me and let the responsible food blogger emerge. I decided to bake with the 85% dark chocolate which is oh so good for baking. The muffins came out all moist and chocolate-y with just a hint of mocha. This is an easy recipe to bake, I have adapted this fail-proof recipe of Nigella Lawson's. 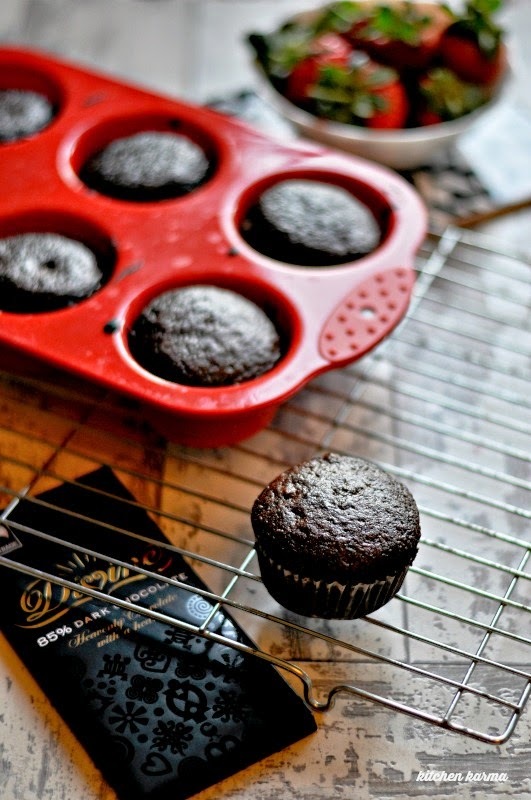 The reason I love baking muffins is that they are so very hassle free to make. The batter is so very easy to mix. No laborious mixing, just put all the ingredients together and mix it all once by hand. Don't be tempted to over mix it. I did once when I initially was learning how to bake muffins and those came out as hard as rocks. The prep takes only a few minutes. Verdict: These are dark, dense and extremely moist muffins with a hint of a coffee flavour. 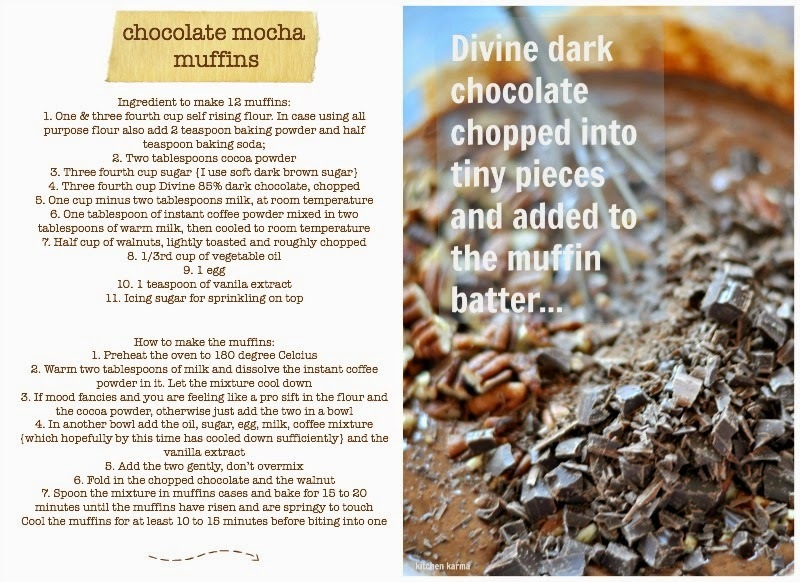 So next time you want some chocolate, try Divine, their range is pretty fantastic and next time you want to bake something quick and easy, why not try these muffins? Download this recipe as PDF or add it to your Google drive. 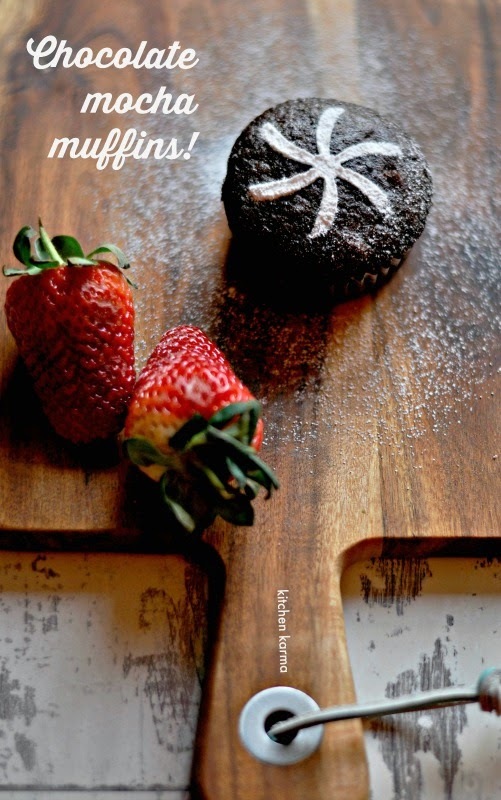 I am no longer eating as much chocolate as I used to, but such muffins I would surely try with pleasure! Beatiful shots! I could do with one of these right now.